Back cover blurb: A dazzling debut novel about taking chances, finding hope, and learning to stand up for your dreams.. Everyone in Wheeler, New Mexico, thinks Joanna leads the perfect life:the quiet, contented housewife of a dashing deputy sheriff, raising a beautiful young daughter, Laurel. But Joanna’s reality is nothing like her façade. Behind closed doors, she lives in constant fear of her husband. She’s been trapped for so long, escape seems impossible until a stranger offers her the help she needs to flee.. On the run, Joanna and Laurel stumble upon the small town of Morro, a charming and magical village that seems to exist out of time and place. There a farmer and his wife offer her sanctuary, and soon, between the comfort of her new home and blossoming friendships, Joanna’s soul begins to heal, easing the wounds of a decade of abuse. But her past and her husband aren’t so easy to escape. Unwilling to live in fear any longer, Joanna must summon a strength she never knew she had to fight back and forge a new life for her daughter and herself.. So I loved the beginning and end of this novel, but am a little bit stuck on the fence about the middle part! Joanna is the victim of the worst kind of domestic abuse imaginable. She is terrified for her and her daughter Laurel's life's, but as she is married to a deputy Police Sheriff she knows that it is almost impossible for her to leave her husband as no one will believe her story and they will all be on her husband's side. That is until an unexpected face from her husband's past turns up without warning. The guardian angel that Joanna had given up hope of ever seeing. As she makes plans to leave the town of Wheeler with Laurel she knows that she must get this right if they are both to survive. Then we get to the middle part of the novel where Joanna and Laurel appear in the small town of Morro with no recollection of how they got there, and only vague memories of the day they left Wheeler. This part of the novel for me, lacked a certain something, but I can't put my finger on exactly what. Maybe it's just that the novel wasn't taking the path I was expecting it to, and I found myself less than engaged by it, but by the time I reached the novel's climax I had been reeled back in and was hooked again. This is a great debut and don't let my thoughts put you off discovering this for yourself. I am intrigued to read what this author has in store in the future. 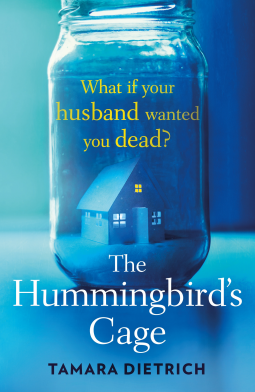 The Hummingbird's Cage is available from 25 August 2016.